Weaning Advice & Workshops in Surrey & Hampshire. Call 01252 706995 - Mind-Body Wellness, Hypnotherapy and NLP ..............Fix the Cause, not just the Symptoms! ﻿Want help weaning your baby or having problems with a fussy eater? Want the best for your baby or child? Interested in health for you, your family and weaning your baby? Confused about what information is correct and nervous about starting weaning? Then this advice is what you are looking for. I have a son who was born in 2010 and enjoyed developing his taste and health with a varied diet. He was eating an array of foods within weeks of weaning and now is a lover of food, just like his dad & I, enjoying curries, Thai food, Italian, Mexican, seafood and anything with taste! In order to set a child up for life my goal is to maximise their potential to eat a wide variety of foods to gain a balanced diet. This can be achieved by helping children enjoy food early on and eat with the family resulting in minimal effort for the carer/parent cooking for the family. So what can I do for you to help with your weaning challenge? Maximise your child's health now and help programme your babies genes through milk feeds and food so that they will be healthier later on in life - Amazing new evidence!!! Decide on the best weaning method for you and your baby - Summarise your options. Recipes and tips of how your baby can eat the same as you. Make life as easy as possible by learning how to cook virtually the same for your baby as the rest of the family. In addition to the weaning advice, I can help you if you are worried about your child's eating and provide you with a report advising you how you can make positive changes and therefore allaying any fears you may have had. This can include home visits to get a clearer understanding of your individual situation and child's behaviour at meal times. Great news, we are officially loved! 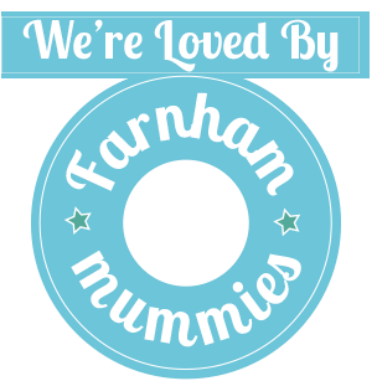 We have just been awarded our very own loved by badge from Farnham Mummies Club. We are one of their recommended businesses and they (and their 1,600 members) love what we do. So am I the right Nutritionist to help you with your weaning? In addition to my weaning workshops & classes and private clients, I have written many articles for NCT magazines, newspapers, magazines, Baby London, Baby Hampshire, Baby Surrey, and others related to Weaning and Infant Nutrition; carried out Q&A sessions for a multimedia companies called www.minisocial.com, Live Guru and now for Sofeminine.co.uk, patient.co.uk and other online advice websites, which have and continue to be a great success. I look forward to helping you on this journey and having fun on the way.